You may make a curve adjustment in Photoshop Creative Suite 5 only to discover that some areas of the image are still too dark or too light. Because you used an adjustment layer, you can turn off the correction or change it repeatedly with no degradation to the quality of the image. 1Select the area of the image that needs adjustments. Any area that is not quite perfect will do the trick. 2Choose Select→Modify→Feather to soften the selection. The Feather dialog box appears. 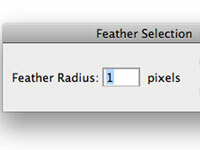 3Enter a value into the Feather dialog box. If you’re not sure what value will work best, enter 15 in the Feather Radius text field and click OK.
You can also click the Refine Edge button in the Options panel (when you have a selection tool active) to preview the feather amount. 4Click and hold the Create New Fill or Adjustment Layer icon and select Curves. 5In the Curves panel, click the middle of the curve ramp to create an anchor point; drag up or down to lighten or darken the selected area. 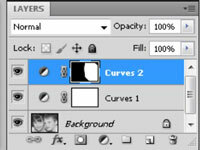 Notice in the Layers panel that the adjustment layer, Curves 2 by default, has a mask to the right of it. This mask was automatically created from your selection. The selected area is white; unselected areas are black. 6With the adjustment layer selected in the Layers panel, use the Brush tool to paint white to apply the correction to other areas of the image; paint with black to exclude areas from the correction. You can even change the opacity with the Brush tool in the Options bar at the top to apply only some of the correction!